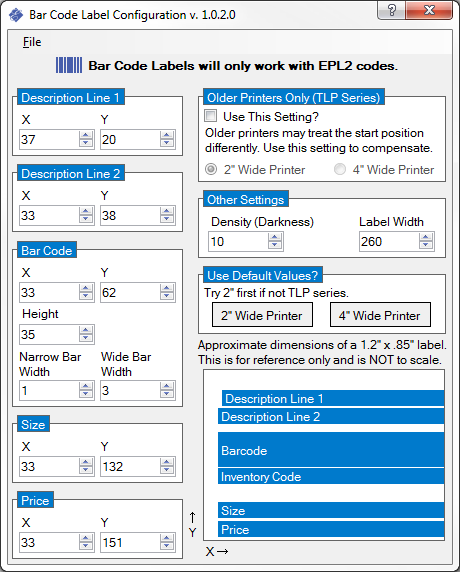 Bar code printing only works with EPL2 compatible printers. The bar codes will only print in PAGE MODE (EPL2). LINE MODE (EPL1) will not work. Check your manual or call the manufacturer for more information on PAGE MODE and LINE MODE settings. A BETA application, InbarcdEdit, is available to assist in adjusting the barcode settings. Download it, unzip it into the Execu/Suite software folder and run it from that folder. It's still in Beta testing so email us if you experience any issues with it. You can still edit the settings manually using the instructions, below. The panel on the lower right shows the approximate dimensions of the label and the printed elements. This is not to scale and should not be considered an exact representation of what will be printed. Its purpose is to assist you in roughly positioning the printed elements before printing test labels. Save the settings by clicking File then Save. Print a test label by clicking File then Print. Select the bar code printer. You should print test labels before saving. Don't modify the Narrow or Wide Bar settings unless you're using a label larger than 1.2" wide. Use This Setting? = Click to enable the use of the printer width setting. This makes an adjustment to the layout display to assist in configuring older printers. 2" Wide Printer = Click this if your printer can only handle a 2" wide label. 4" Wide Printer = Click this if your printer can handle a 4" wide label. This is the most common setting. ON OLDER PRINTERS (like the Zebra TLP 2844) affects line wrapping. If the Label Width is too low, characters at the end of the line will print first. If the Label Width is too high, characters will begin printing off of the label, to the left. Adjust this setting so that the lines begin near the left edge of the label and then fine tune the X and Y settings for each line. ON NEWER PRINTERS (like the Zebra GC420d) affects the print start position and width. On newer printers, this settings works like it logically should. If you specify that your label is 260 dots wide, the printer will adjust its start position to the correct place. Because of this, use the default settings for a 2" wide printer as your starting point, then fine tune your adjustments from there. These buttons allow you to use the default settings for either a 2" or 4" wide printer. This is a sample of the bar code printing configuration file INBARCD.FIL located in the software installation folder. This sample is for a 4" wide bar code printer. If INBARCD.FIL is missing, these settings are used. Open this file with NOTEPAD. All numbers, except for Density, refer to DOTS. 1mm is 8 DOTS. Horizontal DOT values are absolute printer values, meaning it is measuring from the printer's left margin and not the label's. Because of this, you will need to make adjustments if the label width changes or you get a new printer. The barcode is Code 128. Label size is intended to be 1.2 X .85 Inch, but can be larger. If you use a larger label, adjust the settings, above, to fit. This program communicates to the printer using the EPL2 Standard, specifically for the Eltron Orion / Zebra series of printers. This should work for any printer using this standard, but we only support the printers for which it was written. To move things to the right, increase the Horizontal Start (X) number, or to move them to the left, decrease the number. You may need to adjust this from time to time as the printer wears out. You may also need to adjust this if you buy a new printer and it doesn't print like the last one. To move things down, increase the Vertical Start (Y) number, or to move them up, decrease the number. You shouldn't change the Barcode WideBar Width or the Barcode NarrowBar Width unless you are using a barcode larger than the 1.2 X .85 Inch label, because it will make the barcode too wide. Do not make it smaller under any circumstance. If the barcode is too light, and the bars aren't solid and well defined, increase the Density. If they are too dark and look like blobs, decrease the Density. If the printed data seems to be 'wrapping around' then you may need to adjust the Label Width. This is especially needed when a 2 inch printer is used rather than a 4 inch printer. Reduce this number to the 100 - 150 range for a 2 inch printer and adjust it from there. Each printer will print differently. Some are close enough to not cause a problem, but some will require significant adjustment. Make sure you can print a Windows Test Page. Make sure the printer is in PAGE MODE. If you have the 4" wide test roll, print a label to it. If the label prints in an area to the right or left of where the more narrow 1.2" labels rests, you'll need to modify the configuration file. If the text lines look like they're 'wrapping' and the end of the line is printing first, increase the Label Width setting a little at a time. If the printer is feeding more than one label after a single label has been printed, it's likely because the printer isn't properly detecting the 'Gap'. According to the Eltron EPL2 Programming Manual, "The Gap method detects the difference in optical density of a label on a liner from the liner only with the Transmissive (Gap) sensor." The Eltron EPL2 Programming Manual also states, "All EPL2 printers have an AutoSense feature to optimize label and label gap detection by the transmissive (gap) sensor. See the printer’s user’s manual for printer specific sensor adjustment control." You'll have to look in your printer manual for instructions on adjusting this setting. We can't tell you how to do it. For instructions on printing bar codes see Print Bar Codes.